It’s been awhile since I’ve reported on my 700-gallon (including sump) reef tank. The tank now in its 3rd year is thriving. 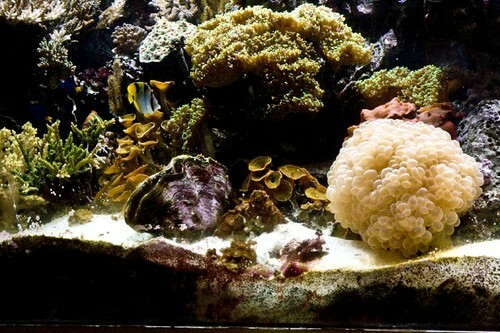 Readers will remember that I moved my fish and corals from Massachusetts to Maine several years ago with disastrous results to the fish, but not to the corals. My old fish all died of a protozoan infestation, probably brought on by the stress of the move. Most of those fish were with me on average about 15-years, with the oldest an anemonefish of 23-years. Most of the invertebrates are of equal age and are still doing well. Photo 1: This is a full tank shot. Photo 2: This is a close up of a section of the tank. I replaced all of the fish that I lost with juveniles, and in the two plus years these juveniles have grown quite rapidly so that they are near to the size of the fish they replaced. 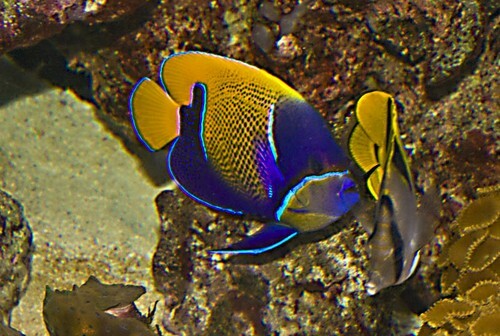 There are a number of these fish that for reef keepers are controversial – the triggerfish, angelfish, and even a butterflyfish. So, in this editorial I will report on these fish. First, the triggerfish. 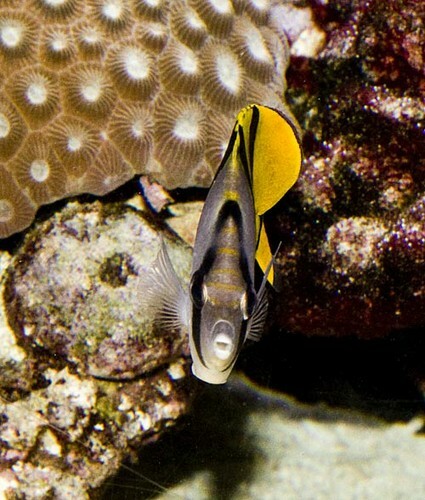 My Clown triggerfish (Balistoides conspicillum) grew very rapidly to become the boss of the tank. It does not bother any of the invertebrates. However, it occasionally makes it clear to the other fish that it is the dominant fish in the tank, but has never hurt another fish. The Picasso triggerfish (Rhinecanthus aculeatus) bothers nothing. Although, it has a rather annoying habit of taking mouth full of sand which it then drops on clams, and magnets, which I have to remove and carefully clean. If I didn’t it would scratch the tanks acrylic lens. Photo 3: Close up of C. falcula. Photo 5: Majestic and butterfly. My angelfish, an adult Majestic angelfish (Pomacanthus navarchus) is shy and bothers nothing. To my eye it is the most beautiful fish in the tank. 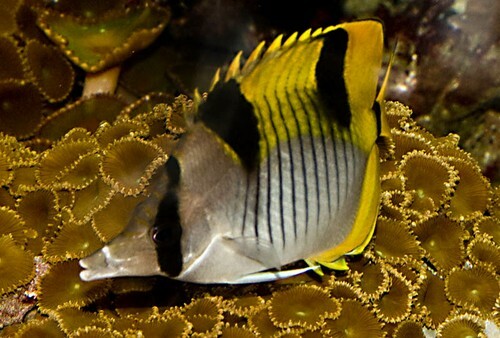 My double banded butterflyfish (Chaetodon ulietensis)was the last fish added to the tank. I added it to the tank for a specific reason: to eliminate the Majano sp. anemones that eluded my attempts with Joe’sJuice and other concoctions. I had done this before with my earlier reef tank with great success. In the past tank this butterflyfish both eliminated all of these invasive invertebrates and ate with vigor the flake food that I fed the rest of the fish. The past C. ulietensis didn’t bother any of my corals and I’m happy to report that the new one doesn’t either. In fact, at the Waikiki Public Aquarium, J.C. Delbeek reports that same behavior from the one there that has been there for a number of years. Does this mean that this particular butterflyfish is reef safe? The answer is that I don’t know, but so far three out the three that I know of is a good score for a fish that will eliminate an invasive anemone that left unchecked will destroy a reef tank.